Breastlight is a product that allows you to see inside your breasts. It works by shining a powerful light through the breast tissue. It is completely safe and easy to use. Over 80% of women have told us they feel more confident when using Breastlight as part of their breast awareness routine. We call this enlightened breast awareness. Breastlight is a new health and wellbeing product for women. It helps women notice any changes in their breasts over time. With Breastlight you get a new view of your breasts. 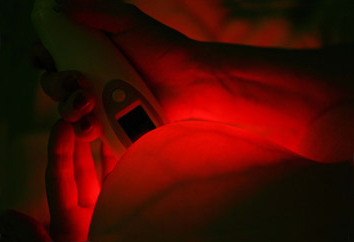 Breastlight shines a harmless red light through the breast tissue so that you can see some of the details inside. That way you can get to know what’s normal for you, spot any changes and hopefully feel more confident that you’re looking after your body the way you’d like to. Breastlight is used in a dark room. Looking down at the breast from above. What will you see when you use Breastlight? You will see veins and other blood vessels as dark lines in your breast. These are totally normal. 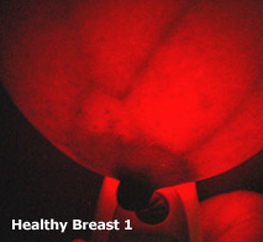 Over a number of months you will learn what your breasts look like when lit by yourBreastlight. This internal view will become as familiar to you as the look and feel of yourbreasts on the outside. As with all the aspects of breast awareness the important thing is to look out for any changes. WOMEN WHO ARE INVITED FOR A ROUTINE BREAST SCREENING ARE STRONGLY ADVISED TO ATTEND. Breastlight can be used by women of all ages, particularly menopausal or post-menopausal women when the density of the breast tissue has changed. It is also useful for women with fibrous breasts that always feel lumpy. The Breastlight will distinguish between normal breast tissue and areas where blood vessels are present that could indicate a potential abnormality. Technical Explanation Breastlight is designed to give the maximum light transmission through the breast tissue. Even so, only a small fraction of the light will pass through completely – and this is what you will see when you use the product. That’s why it’s important to use Breastlight in a very dark room. We use red light to give the best contrast and enable you to see the maximum detail. The light is completely harmless and has no invisible rays. You can use Breastlight as often as you like with no side effects. 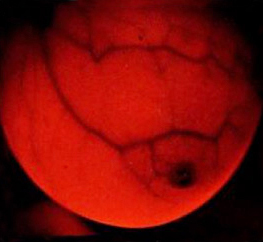 When the light hits a blood vessel in your breast it is absorbed by haemoglobin. This makes the veins in your breast appear as dark lines. Malignant lumps have an increased blood supply to feed them so any dense areas may indicate an abnormality. Fluid filled cysts, however, will not absorb the light. Breastlight is an innovative product which has been tested with over 1,200 women. Response from all the studies so far has been extremely favourable. Women instinctively find Breastlight easy to use as part of their regular breast awareness routine and have told us that it gives them confidence when checking their breasts. Lumpy breasts In particular women with lumpy breasts who find palpation difficult found that Breastlight was a very useful aid for self checking Larger breasts Often women with larger breasts feel less sure with self checking and they reported that Breastlight gave them more confidence. I have lumpy breasts. When using Breastlight would I see lots of dark shadows? It depends if the lumps are fibrous, fatty or fluid filled cysts. If so as there is no extra blood present, NO shadow will be seen. If however you see a shadow in the breast it could be a blood filled cyst, bruise or a growth. Any lumps that are causing you anxiety should be seen by your doctor or nurse. Does Breastlight work with my implants? Yes, Breastlight works very well with implants. It is difficult for women with implants to check their breasts, so Breastlight becomes an invaluable aid to breast awareness for these women. I have very dark skin, surely Breastlight won't work on me? Breastlight works well on ALL skin tones. I have extremely large breasts, can I use this device? It may help if you get a close friend or partner to hold your breast while you use Breastlight, but there is no breast size restriction in using the device. I have had a breast reduction, can I use Breastlight? Yes, you may use Breastlight. You will notice the scar tissue is thicker and dependant on how long ago you had the reduction you may see an increased blood supply (which will show as darkened areas). I have had a lumpectomy, should I use Breastlight? Yes, it is fine to use Breastlight when you have had any type of breast surgery. You will see slightly thickened tissue at the operation site. It is also really important that you take care of your breasts now and check them regularly. Why do I need to alter the intensity of the light in Breastlight? The density of breasts varies; this is dependent on lots of factors - age; size; hormonal changes and the time of the month. The denser your breast the higher the intensity light you need. 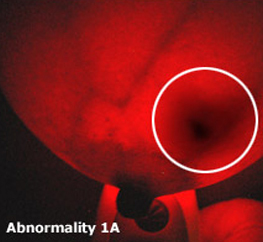 Too high or too low a setting will mean that blood vessels are not seen clearly, so try different brightness. I am really frightened about using Breastlight for the first time - suppose I find something? It is not uncommon for women to be slightly anxious using Breastlight for the first time. Over time you will become more aware of what is normal for you and therefore more confident that you will notice any changes in your breasts. Remember it is not a diagnostic device and if you do see any changes or are concerned contact your doctor. If I use Breastlight regularly do I still need to look and feel my breasts for changes? YES. Breastlight should be used in addition to your normal breast awareness routine. You should continue to look and feel your breast tissue and should always attend screening when invited. What is the light used in this Breastlight? Is it safe? The light is visible light of a specific wavelength from a set of LED's (light emitting diodes). It is completely safe. You can use Breastlight as often as you like but we recommend that you use it on a regular monthly basis. How does light show up blood in my breast? 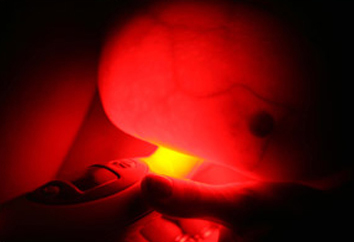 The red LED light is absorbed by the red blood cells in your blood. This enables you to see the blood vessels as dark lines. You can monitor any changes that occur. You should look for changes such as dark areas or shadows that should be checked by your doctor. What size will a tumour be that Breastlight detects? In the clinical trials carried out on Breastlight tumours over 2cms were detected in the majority of cases and tumours under 2cms were detected in well over 50% of cases. Of course you have to bear in mind that this depends on where the tumour is in the breast. Can I use Breastlight now that I am pregnant? Yes you can use Breastlight when you are pregnant but your breasts will be changing, and receiving an extra blood supply. It is advisable to stop using Breastlight until a few months after you have finished breast feeding as your breasts will be full of milk and you will not be able to see very much. There is no harm in using Breastlight, but the results would be unsatisfactory. Why do I need to use Breastlight in the dark? Only a small proportion of the red light passes through the breast so you need to remove any background light to illuminate the blood vessels. The darker the room, the easier it is to use. How often should I use Breastlight? You can use Breastlight as often as you like as part of your normal breast awareness routine. Is Breastlight safe to use? All of the light from Breastlight is visible – there are no invisible rays and the light is completely harmless. You can use Breastlight as often as you like with no side effects. How do I know I am using Breastlight correctly? If you have any questions about Breastlight or if you are worried about using the product you can call our helpline. A specialist breast care nurse will be able to answer your questions. Just call her on 0845 251 4448. The helpline is open from 9 am until 6 pm every day. What if I see something I’m not sure about? What if I feel something in my breast but can’t see anything with Breastlight? You should ask your doctor about it as soon as possible. It may be harmless but your doctor will be able to advise and reassure you. What if I see something with Breastlight but can’t feel anything in my breast? If I use Breastlight, should I still attend my routine breast screening? Absolutely YES! Breastlight is not a substitute for the routine breast screening you receive if you are aged 50 or over. It should just be used as part of your normal breast awareness routine at home. Will Breastlight show up a DCIS lesion? Ductal carcinoma in situ (DCIS) is an early form of breast cancer, sometimes described as an intraductal or non-invasive cancer. If the cancer has angiogenesis associated with it then it should show up using Breastlight. Such lesions have been detected with Breastlight research. Where can I buy Breastlight? Can I use Breastlight even if the batteries are not fully charged? If the power in the batteries is too low then the light will cut out. If this happens, and you want to continue your examination, Breastlight can be used with mains power using the adaptor and cable supplied. Why should I use a lubricant with Breastlight? Some women find it more comfortable to use a lubricant, which allows the lens to slide across the skin more easily. Apply the lubricant lightly over the entire breast and wipe off the excess after completing your examination. We recommend a water based lubricant; do not use an oil based lubricant as this may damage your Breastlight. What does being ‘breast aware’ mean? Doctors recommend that women know how their breasts look and feel so that you know what is normal and healthy for you. This is called “breast awareness”. Over a number of months you will learn what your breasts look like when lit by your Breastlight. This internal view will become as familiar to you as the look and feel of your breasts on the outside. As with all the aspects of breast awareness the important things is to look out for any changes. When you are looking at your breasts with Breastlight you may also see other dark areas. These could look like very dark spots or a shadowy area. 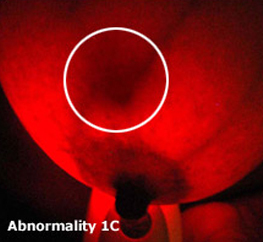 It is possible that these are abnormalities in the breast. If you see these you should go to your GP for advice. These pictures illustrate what to look out for. NOTE : these pictures have been created for illustrative purposes and are not clinical photographs. If you had your breast removed and reconstructed, you will not be able to use Breastlight, as it only works on breast tissue. A total mastectomy will remove all the breast tissue;reconstruction uses implants and skin graft tissue. The brightness setting indicator shows you the level of brightness that you have selected. There are four settings to choose from. The battery charge symbol will show you how much battery life is left and will flash when the battery needs charging. The temperature indicator will only come on if the product has overheated. In this unlikely event the unit will cut out symbol will flash until Breastlight has cooled down sufficiently and it is ready again for use. The days since last used indicator shows how long ago you last used your Breastlight. You may find this useful as a reminder. Breastlight is powered by a set of rechargeable batteries. Before the first use they will need to be charged for 4 hours – after that recharging is faster. If you are using the device with mains power please ensure the cables and power supply cannot get wet and take care not to trip over the cable. Breastlight uses skin sensing technology to ensure that the light is only at full power when the lens is in contact with your skin. The skin sensor needs time to reset itself when you switch the Breastlight on, so wait for a couple of seconds before placing it against your skin. Breastlight emits light in a visible wavelength. This is completely safe and will not cause any damage to your skin or breast tissue. We advise you not to look directly into the light when it is at any of its bright settings. This will not cause any permanent damage but may cause a temporary dazzling effect. Breastlight may be cleaned using a dry tissue or slightly damp cloth. Breastlight is not a waterproof device. Breastlight should not be used in the shower or in the bath. Do not throw the appliance away with the normal household waste at the end of its life but hand it to an official collection point for recycling. By doing this you will help to preserve the environment. Whilst Breastlight is a valuable aid to breast awareness, Breastlight is not capable of detecting all sizes, positions and types of breast abnormalities. It is not intended for use as a diagnostic device. 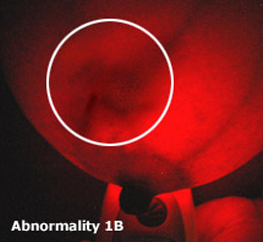 Breastlight may highlight a potential abnormality that subsequently turns out to be normal or requires minimal medical intervention. For example blood filled cysts and haemotomas will appear as dark areas. However we would recommend that any suspicious signs are investigated by a doctor. Breastlight is not suitable for use when breast feeding. If in doubt please seek the opinion of a medical professional.